In the early 1900s Rhodes was still largely rural. 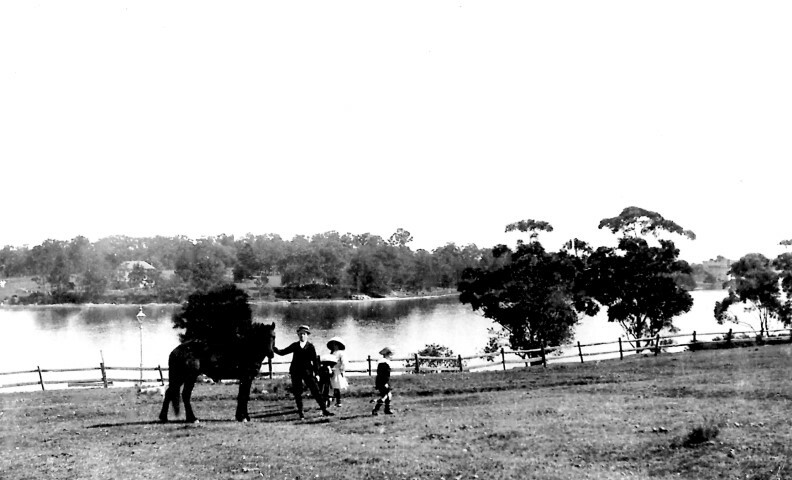 Uhrs Point at Rhodes takes its name from George Richard Uhr (1822-1864) who built his home there, overlooking the Parramatta River. Uhr held the position of Deputy Sheriff and later Sheriff of NSW. He was, like his brother William Cornelius, also an amateur composer. Records indicate he composed The Australian Rifle Corps March for pianoforte which is now apparently lost. The property was later owned by Charles Davis who built his home, ‘Llewellyn House’ there in 1886. In 1912 the land was subdivided for housing. It was advertised as being twenty minutes from the city and famous throughout Australia as the starting point of all the great boat races. Llewellyn House at Uhrs Point is just visible in the background of the photograph, above, taken from the opposite shore at Riverside Estate, Ryde in about 1910. The original photograph is held by Ryde District Historical Society. At 11am on Wednesday, 25 May people around Australia will be reading I got this hat by Jol and Kate Temple, illustrated by Jon Foye, as part of National Simultaneous Storytime 2016. To coincide with the event, Concord Library has a display of hats on loan from the City of Canada Bay Museum. It includes a range of ladies’ hats from the 1950s and 1960s, a Concord Citizens’ Band cap and military hats. Pride of place goes to the NSW Fire Brigade’s brass helmet. 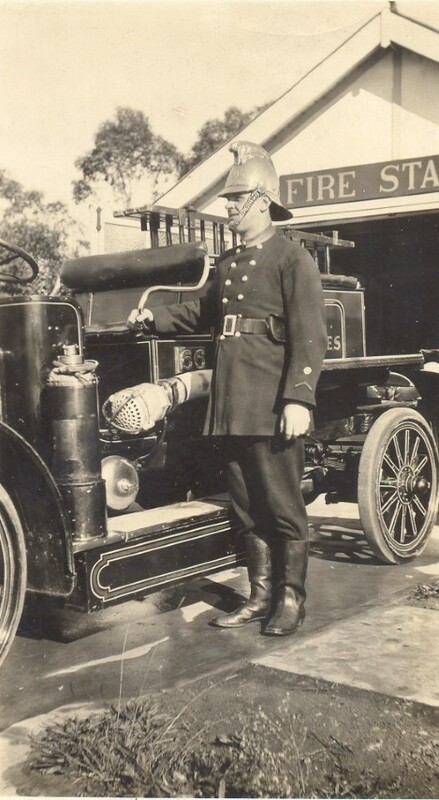 The photograph shows Volunteer Fireman Walter S. Pettit of the Rhodes Fire Brigade, about 1930, looking resplendent in one of these magnificent helmets. The prominent top comb provided extra strength to the helmet as well as added protection against falling objects. The comb is decorated with a stylised dragon which is a reference to the dragon being, in some mythologies at least, a guardian spirit. The brass helmets were, incidentally, made locally by Rider & Bell Pty Ltd at Cavell Street, Rhodes. Come along and join in the fun at the library on 25 May 2016. The name of Rhodes newest park, Lewis Berger Park, recalls the industrial heritage of the area. Berger’s origins go back to 1760 in England when chemist Louis Stegenberger (later known as Lewis Berger) began manufacturing Prussian Blue. During the nineteenth century Berger paints were imported into Australia and in 1916 the company established a factory at Rhodes to supply Australian needs. The Rhodes factory produced white lead used in the production of paint at that time. After the First World War the company continued to expand. In 1932 the factory supplied some 60,000 litres of paint for the Sydney Harbour Bridge while during the Second World War it provided paint for military purposes, especially aircraft. The opening of Lewis Berger Park will be marked by a community picnic on Saturday, 30 April 2016, 2pm-4pm. A special feature of the park will be the Berger History Trail. The Berger War Memorial which has been full restored will also be re-located in Lewis Berger Park. The illustration, above, is from a Berger advertisement of 1938, titled ‘A factory set in sunshine’. City of Canada Bay has recently launched the Rhodes multimedia history project which features oral histories and videos of thirteen local community members and three community groups (Rhodes Volunteer Fire Station, Dragon Sports Association and Rhodes Multicultural Community Association). Council worked in partnership with local residents and Peta Khan from Maitree House, the project’s creator. 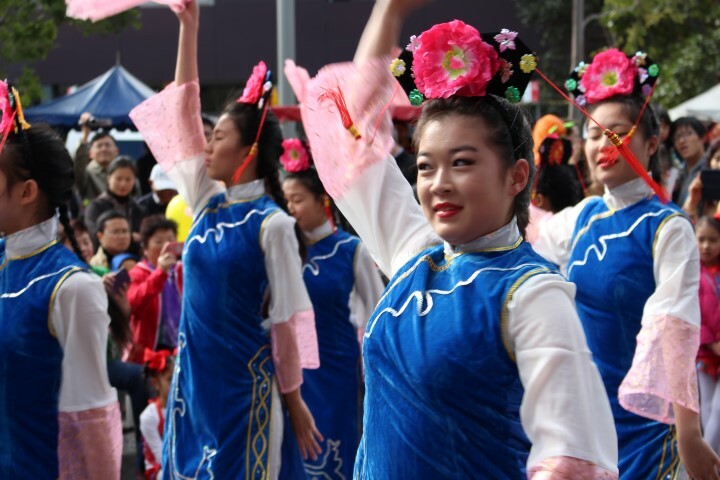 The videos celebrate the diverse and vibrant community now living in the Rhodes precinct. The videos can be viewed on City of Canada Bay’s Youtube Channel. The videos will also feature in an opening display at The Connection, Rhodes Community Precinct in 2016. The photograph shows dancers, organised by Rhodes Multicultural Community Association, performing at the Rhodes Moon Festival. 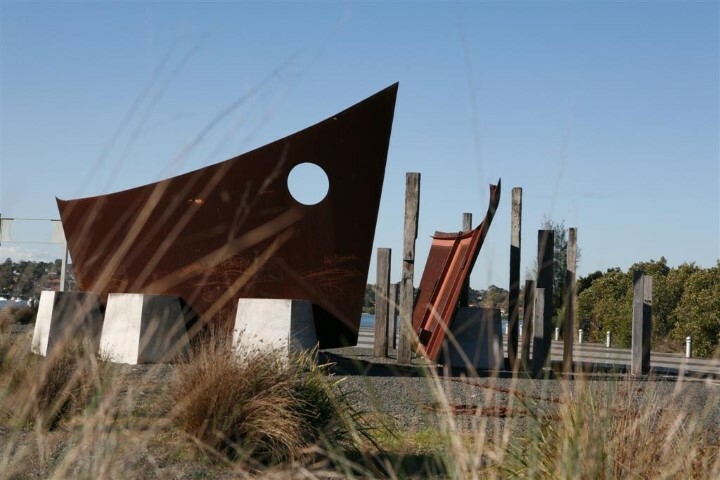 The sculpture by Nola Farman at Brays Bay Reserve commemorates Commonwealth Ship Building Yard no. 4 which operated there during the Second World War. As the war intensified in the Pacific there was a need for small vessels to operate in the waters to the north of Australia. The government established the Small Craft Directorate of the Department of Munitions to construct small shallow-draft ships, known as ‘lighters’. Several companies around Australia were involved in their construction. At Rhodes the Tulloch plant established shipbuilding facilities at Brays Bay. Tulloch concentrated on fabricating the bow, first mid-ship section and steel superstructure, while the stern and rear mid-ship sections were constructed by Waddingtons at Granville. The exact number that were built and launched at Brays Bay is unclear but there were at least 13 and possibly as many as 24 vessels built according to David Jehan in his recently published book on Tulloch. In addition to the sculpture, the site of the slipway is still visible and some of the names of the ships are recorded along it. The Australian War Memorial holds a fascinating series of drawings of the Tulloch operations at Brays Bay by R. Emerson Curtis. A new art work by Olev Muska at McIlwaine Park commemorates the service of local soldiers during the First World War. 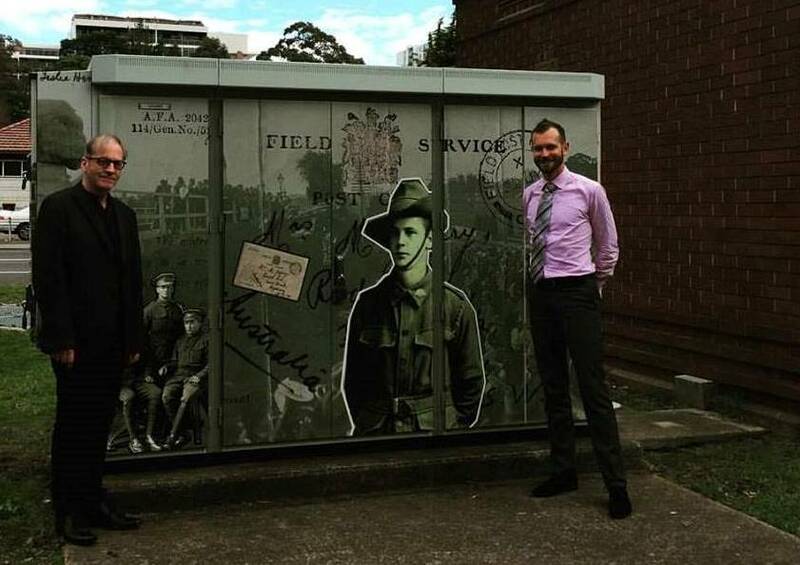 Olev (left) has drawn on images from the Local Studies photographic collection, Canada Bay Connections and the Australian War Memorial to create a fascinating work. Against the background photograph of the unveiling of the Rhodes Honour Roll in 1919 can be seen images of Walter Brooks, the Seabrook brothers and a Field Post Office card sent by Harry Jeffery to his mother before going into battle. The art work ensures that those who served in the First World War are remembered as ‘More than just a name’. The Second World War ended 70 years ago on the 15 August 1945 when Victory in the Pacific was declared, following the unconditional surrender of Japan. Conflict had ended three months earlier in Europe on the 8 May 1945, known as VE Day (Victory in Europe). In 1945 there was a thanksgiving service to mark Victory in the Pacific at the corner of Flavelle and Wellbank Streets, Concord near the site of present-day Concord Library. 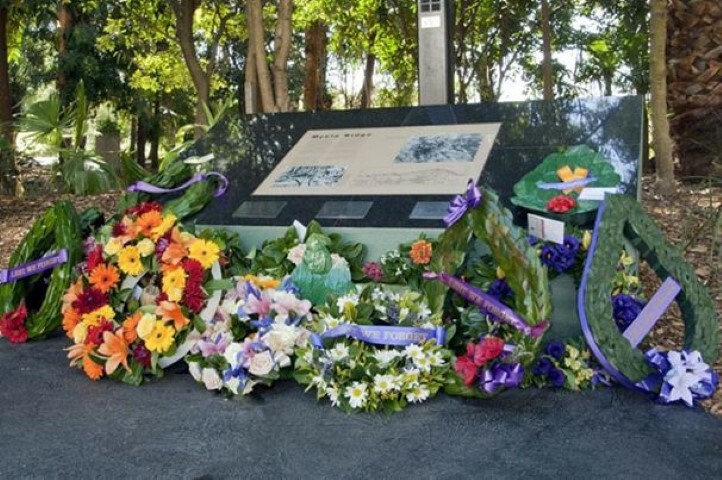 The 70th anniversary will be commemorated by a special service at the Kokoda Track Memorial Walkway on 15 August 2015 at 2pm. The Kokoda Track Memorial Walkway is a beautiful memorial to veterans of the Second World War, in particular those who served in the South West Pacific. The 800 metre rainforest walk links Concord Repatriation General Hospital, where many veterans were nursed back to health, and Rhodes Railway Station. A series of 22 stations along the walkway highlight places of significance in the New Guinea campaign and pays tribute to the tremendous sacrifice made by Australian soldiers. 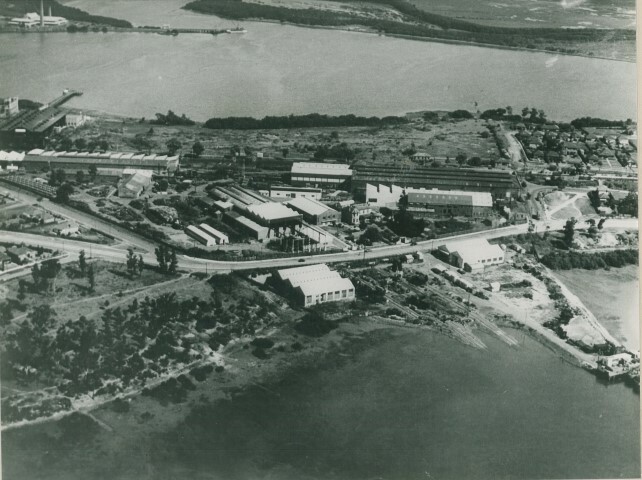 CSR Chemicals Limited commenced manufacturing operations at Rhodes in 1953. The site near Rhodes railway station had previously been occupied by Hoskins pipeworks. A wide range of chemicals and associated products were produced at the plant, ranging from cellulose acetate to ascorbic acid (vitamin C). The first cellulose acetate, used in acetate rayon and plastics, to be manufactured in Australia was produced at the Rhodes plant in September 1953. Recently, the Birkett family donated digital copies of photographs of CSR taken in the 1950s by John Birkett, to Local Studies. John Birkett worked as an industrial chemist at CSR. The images provide a fascinating glimpse into the day-to-day workings of an industrial plant in the 1950s. 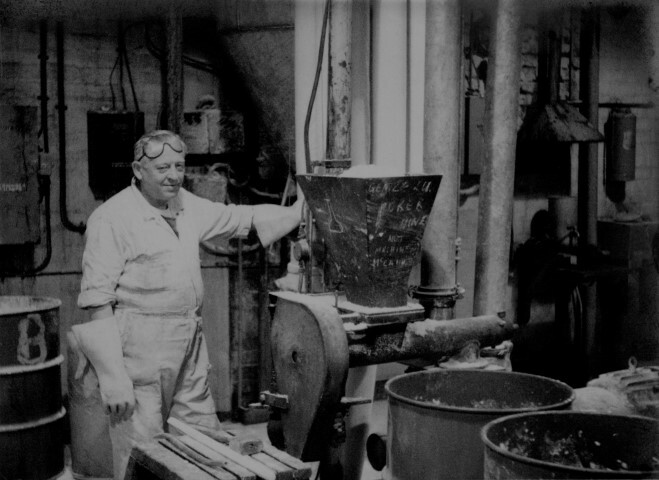 The photograph, above, shows a worker at the sorbose grinder which was part of the process of ascorbic acid production. Other photographs may be seen on Canada Bay Connections (simply type ‘CSR’ in the search box). The CSR site has since been redeveloped. Tulloch’s dominated the Rhodes peninsular for almost 60 years. The company was established by Robert Tulloch at Pyrmont in 1883 and supplied the structural steelwork for many buildings including the Queen Victoria Building and Sydney Town Hall. In 1915 the company moved to Rhodes and diversified their range of products, manufacturing everything from shovels to railway rolling stock. During the Second World War, Tulloch’s contributed to the war effort through manufacture of components for tanks and the construction of ocean-going lighters for the US and Australian armies. David Jehan has recently published Tulloch : a history of Tulloch engineers and manufacturers, Pyrmont and Rhodes, 1883-1974. David will be talking about the fascinating story of Tulloch’s at the Kokoda Education Centre (Kokoda Track Memorial Walkway, Rhodes Park) on Saturday, 8 August 2015 at 2pm. Come along and learn about this important part of Australia’s industrial history which changed the landscape of Rhodes. Bookings for the talk can be made online. Completed in 1886, Meadowbank Rhodes Railway Bridge is amongst the oldest surviving colonial railway bridges in New South Wales. It was constructed during a period of railway expansion overseen by Engineer-in-Chief John Whitton, known as the ‘father of New South Wales railways’. 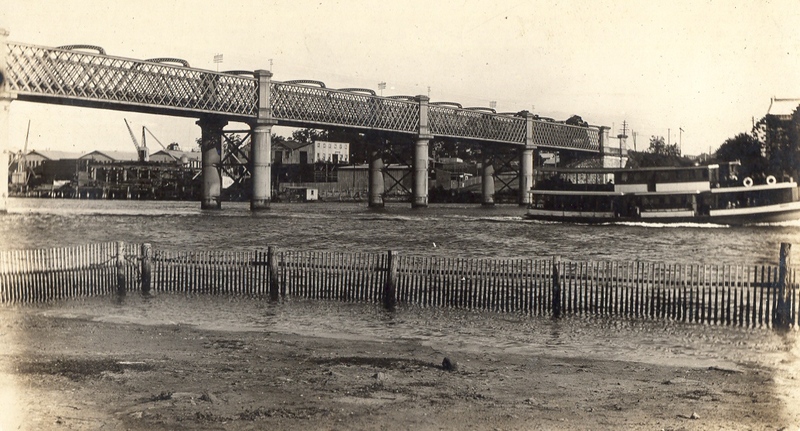 The bridge was typical of late nineteenth century bridge construction using iron lattice girders and is an interesting example of a prefabricated structure. The parts were fabricated by Andrew Handyside and Company in Britain, shipped to Australia and then erected by local contractor Amos Bros. in 1886. The bridge was an important part of the railway infrastructure which linked Sydney and Newcastle. Ultimately, the link connected northern New South Wales and Queensland railways to southern New South Wales, Victoria and South Australia. At the time the growing railway network was seen as a symbol of the emerging federation of Australia. The bridge was decommissioned in 1980, following the completion of the John Whitton Bridge, and in April 2000 reopened as a cycle and pedestrian path.